You might like this game if you like patience style games. 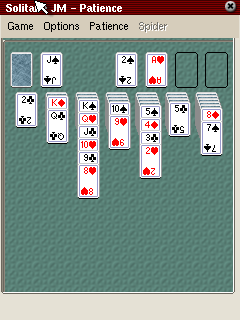 Solitaire-jm is a collection of typical patience type games. 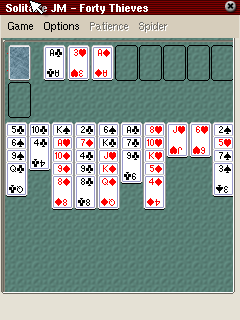 It includes Patience, Freecell and Spider. The aim of the games is to somehow order a pile of cards by moving them on temporary piles until the whole carddeck is in a particular order. The exact mechanism depends on the particular game. This is a simple concept but it keeps people playing it for centuries. All patience games of Solitaire-jm are well known and they are very catching. Therefore there is not much which one can do wrong. The Zaurus implementation of them is well done. Although the display of the Zaurus and therefore the cards are small they are well readable. However, the graphics is quite plain and besides the readability doesn't have much to offer. Although, you can change the card backs, there is not much to choose from. The game play is easy, cards are dragged with the pen and they snap to their places. Unfortunately, the cards cannot be played by double clicking them as known from some other patience type games. The tested game has one more game type then the version included in the Zaurus standard edition. In all other respects the games do not differ much. So if you do not want that particular game type it is not worth installing it. However, if you do - you should as the game is well done.